The dotty Seasonal Decorative Mask is great for creating snowy backgrounds! The 6" square card is made from Cherry Cobbler cardstock. The Smoky Slate layer is 1/4" smaller. Using Whisper White Craft Ink, a sponge dauber and one of the Seasonal Decorative Masks, I inked through the mask to create the snow flakes. Having removed the mask and dried the ink, I sponged more white ink onto the lower part of the card. I used my heat tool on the lower setting to speed up the drying process because white craft ink does take quite a long time to dry. Meanwhile, I stamped the reindeer and teddy onto Crumb Cake cardstock with Soft Suede ink, cut them out with the matching dies and then shaded them with a little Soft Suede ink and an aquapainter. I gave the reindeer a red nose, so I suppose we should say "hello, Rudolph"! The others must be off playing games somewhere without him! I stamped the presents and bows with black ink onto scraps of Emerald Envy, Real Red and Whisper White cardstock and cut them out (the bows have a matching die). I then used a guillotine to cut some very thin strips of cardstock and glued them on to the presents as ribbons, gluing the bows onto the top of the presents. I used the stocking die to cut a scrap of Whisper White cardstock and then then with a scrap of Emerald Envy cardstock. I cut off the top part of the green stocking and glued it to the top of the white one, then glued the teddy to the back of the stocking. I stamped the tree with Garden Green ink onto Pear Pizzazz cardstock and then cut it out with the matching die. I used Garden Green, Pear Pizzazz and Early Espresso Stampin' Write Markers to colour the tree and then adhered it to the front of the card. I scribbled on some glue with the Fine-Tip Glue Pen and sprinkled on some Dazzling Diamonds glitter. I cut the sleigh from Silver Foil cardstock and the decorative top part of the sleigh from Gold Foil Cardstock then used the Fine-Tip Glue Pen to adhere them together. 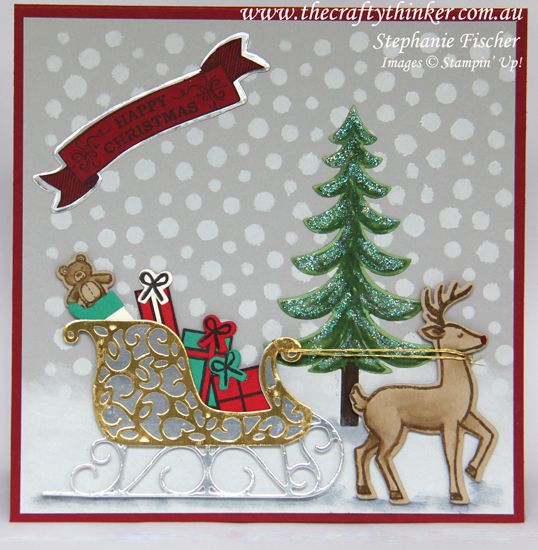 Having glued the presents and stocking to the back of the sleigh, I used Stampin' Dimensionals to position the sleigh on the front of the card. 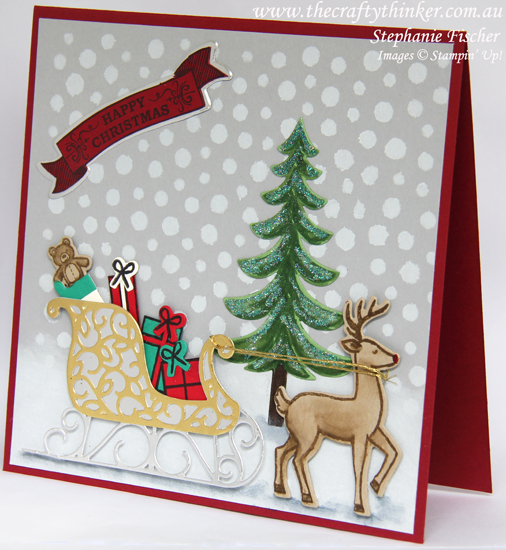 I attached the reindeer with Stampin' Dimensionals and then used a little black ink and an Aquapainter to create some shadows under the tree, sleigh and reindeer. I wanted to add some reins but haven't yet purchased the Bakers Twin Trio, so I plaited together doubled lengths of Gold Metallic Thread. Yes, it was a bit time-consuming .... yet oddly therapeutic! Using Basic Black ink, I stamped the banner from the Seasonal Bells stamp set onto Cherry Cobbler cardstock and then cut it out by hand. I used the Bunch of Banners framelit to cut some Silver Foil Cardstock, layered the red banner on top and glued the banner to the card front.